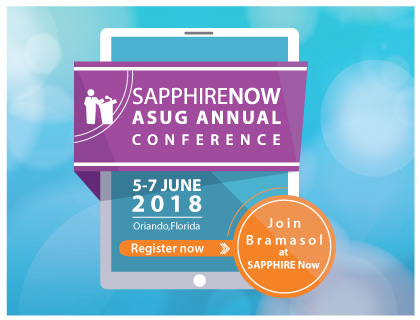 SANTA CLARA, CA– Apr 10, 2018 – Bramasol is excited to be present at SAPPHIRE NOW and the ASUG Annual Conference, SAP’s biggest event of the year! Join Bramasol and learn the latest about our technology innovations and solutions for challenges facing the Office of the CFO in Orlando, June 5-7th’2018. 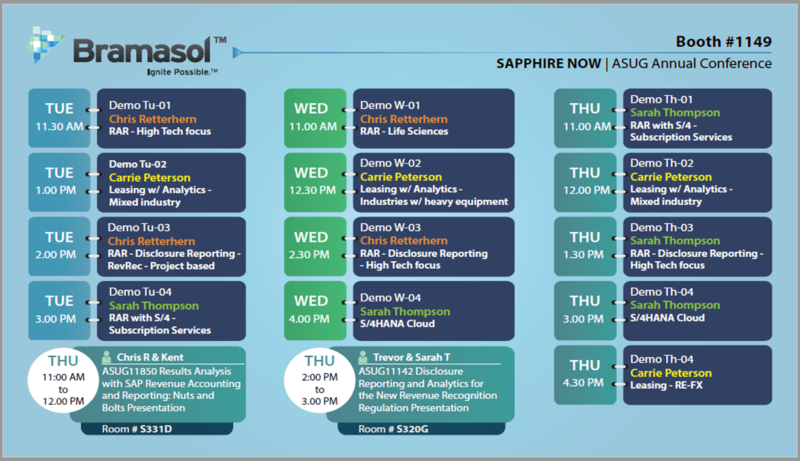 As leaders in compliance solutions, Bramasol will be showing the latest updates on RevRec (ASC 606 and IFRS 15) and Lease Accounting (ASC 842 and IFRS 16), as well as purpose-built packages and adaptable technologies for optimizing compliance within overall Financial Transformation solutions. We will be demonstrating the newest releases of SAP Revenue Accounting and Reporting (RAR) and SAP Lease Administration by Nakisa. In addition, you can see our purpose-built, turnkey packaged offering, RevRec Ready Rapid Compliance Solution for disclosure reporting. If your company’s revenue is project-driven, changes to the results analysis configuration associated with the SAP Revenue Accounting and Reporting application were either (a) a surprise or (b) a surprise. These changes were necessary for your process to function properly. Discover exactly what changed in results analysis and why. The SAP Revenue Accounting and Reporting application is a powerful tool to calculate and book numbers in compliance with the new regulations of ASC 606 and IFRS 15. Bramasol has developed a comprehensive package of reports and accelerators covering all mandated and operational reports. The presenters will discuss the analytics and reports and how they support projects for compliance. Click here to fix an appointment with one of our solutions advisors.